The recipe I’m sharing today is not a chocolate mousse. I appreciate that this may be somewhat stating the obvious, but in my mind this post was always intended to be that mousse. Sometimes things work out wonderfully in the blogging world – long, bright evenings, lots of natural light, photogenic food, other times they conspire against you – unseasonal wind and rain, grumbling tummies that devour anything you’ve made before you have a second to click a single frame. Apparently today this mousse was not meant to be. Chocolate mousse was a staple of my Mum’s dessert repertoire when we were growing up and is something I can make without ever having to consult a recipe or read an ingredient list. There only being two – eggs and chocolate – it’s not that hard to remember. A couple of weeks ago we were on holiday in Italy. Knowing I had a week of cooking for friends in my parents’ gorgeous country kitchen, I’d arrived armed with earmarked recipes, handwritten notes and pages torn from my favourite magazines. Only to discover that the scales they’d promised to buy for the house had somehow never materialized. If you bake you’ll understand that a lack of scales can be a problem. Unlike home cooking which can be much more freeform, baking is as much a science as an art, the wrong proportion of ingredients resulting in airless sponges, crumbling pastry, dense flat dough. Having said that, people managed to make perfectly good puds in the days before digital scales, so I shoved my recipes back in my suitcase and resolved to make do with what I had to hand. For bread I weighed out flour by eye and measured water in a jam jar where the volume was still on the label. Luckily I’d brought out individual sachets of yeast which made my life a lot easier weight-wise, and to add in salt I simply worked out the equivalent amount. Tiramisu was another easy win – one large tub of mascarpone cheese, individual eggs, coffee and alcohol again measured in that jar and sugar added to taste. And then there were my chocolate mousses, rich and dense and dark, made with a simple single egg per person and 55g of good quality dark chocolate. Yummy . . . what more can I say? This mousse is so delicious I’ve been addicted to it ever since, my love for their simplicity revived after our amazing Italian holiday. On Sunday I whipped up a pair to eat after dinner, as well as a batch of these chocolate and pistachio cookies to eat alongside. They were intended as an extra – a little chewy crunch to counteract the mousse and nothing all that exciting. But somehow they stole the show. 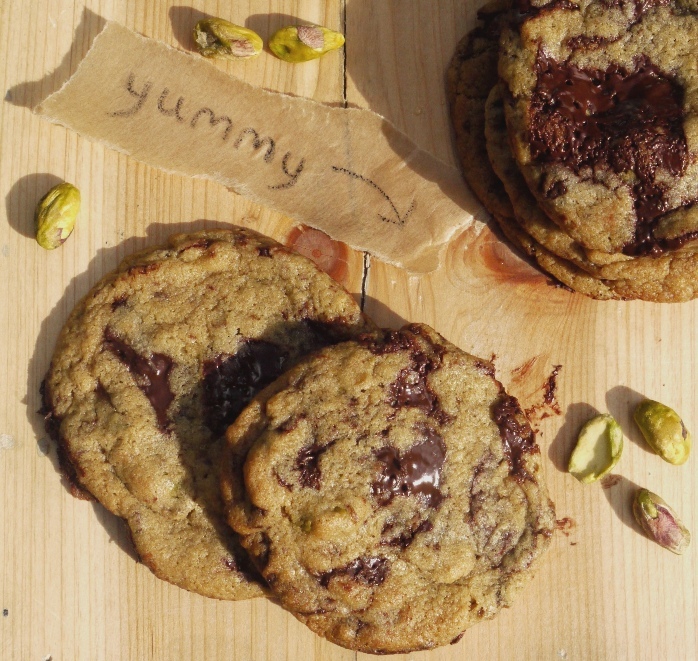 So today I’m sharing a recipe for chewy chocolate and pistachio cookies. I’m aware that there are a quite a lot of cookie recipes on this blog, but we eat quite a lot of cookies so I think it’s fair enough. Plus there haven’t so far been any cookie recipes with pistachios which I think is reason enough to get this up as quickly as possible. A kind of crispier version of these blondies, these cookies are light and chewy with a strong hit of melting dark chocolate and the sweet and ever-so-slightly salty crunch of whole pistachios. They’re incredibly moreish – light enough not to sit heavy in your stomach but rich enough to make them utterly addictive. They also taste incredible sandwiched together with chocolate mousse, the recipe for which I’m going to share soon. Promise. Preheat the oven to 180 degrees C. Line two baking sheets with parchment paper. Cream the butter and sugar in an electric mixer until light and fluffy. Add the vanilla extract and mix well. Add the egg to the mixture a little at a time, beating well between each addition. Mix in the dry ingredients very carefully by hand, bringing together the mixture just enough to form a soft, sticky dough. Fold in the chocolate chunks and pistachios. Scoop tablespoons of the mixture onto your prepared sheets, rounding slightly with your hands. 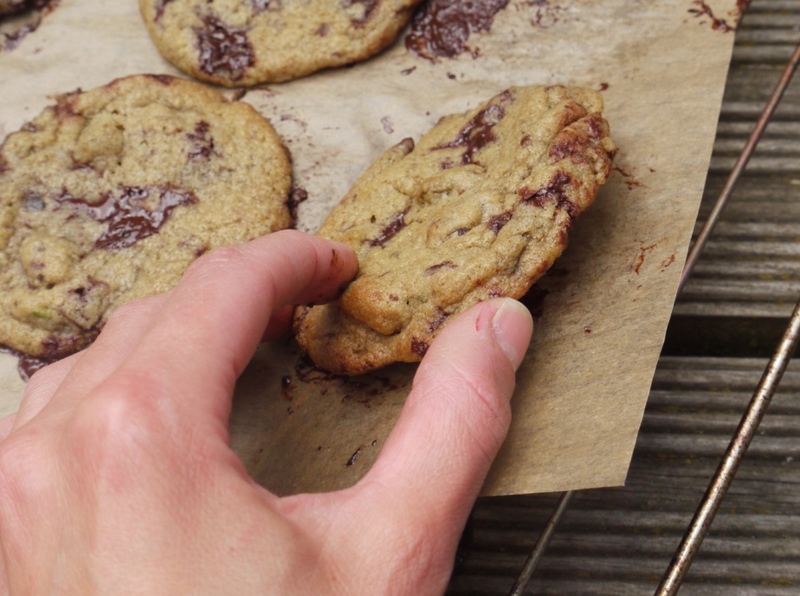 Make sure they are spaced a good few centimetres apart as the cookies will spread slightly when baking. Sprinkle over a tiny amount of sea salt, if desired. Bake in the centre of the oven for 10 – 12 minutes until golden brown and slightly puffed. Remove from the oven and leave to cool on the sheets. They will continue to cook slightly as they cool, so make sure you take them out just the right side of done. If you like them extra crispy with no soft middle, cook for an additional 5 minutes or so. They look fabulous … and chocolate mousse too 🙂 Yum! Is it wrong that I haven’t eaten breakfast yet and I’m dreaming about these cookies? They look wonderful! I am loving the idea of adding pistachios. Yum! Love the combo of dark chocolate and pistachios. I’ll have to try it it a cookie. I bet they’re fantastic! 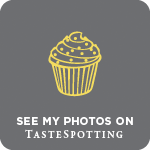 The Single Gourmet & Traveller – glad you like them! Emma – such a good idea. If they haven’t bought one by next year I’m bringing mine out! Sarah – do give them a go, I absolutely loved them. These look delicious, like they definitely melt in your mouth! You can never have too many cookie recipes in my book! This sounds like a lovely combination with pistachios and a perfect looking cookie. Gosh, those cookies look perfect. Love the addition of pistachios. Keep baking! I do love mousse, Loaf… but you also make some of the best cookies I’ve ever seen… they are the one thing I struggle with… I have no idea why. Frugal Feeding – ah, thank you. What do you struggle with? It is texture, size, shape, flavour…? I love chocolate and love pistachios, why did I never think to put the two together in a cookie? Brilliant! And I’m so impressed that you we free form baking in Italy. 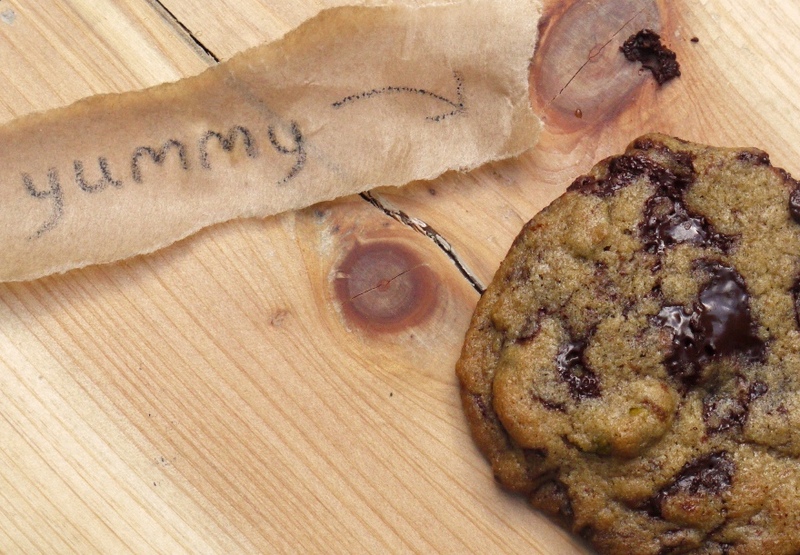 And look what you made… delicious cookies. Sometimes being out of one’s comfort zone leads to all sorts of great discoveries, doesn’t it? I adore chewy cookies and these look amazing. I really love your addition of pistachios with chocolate. 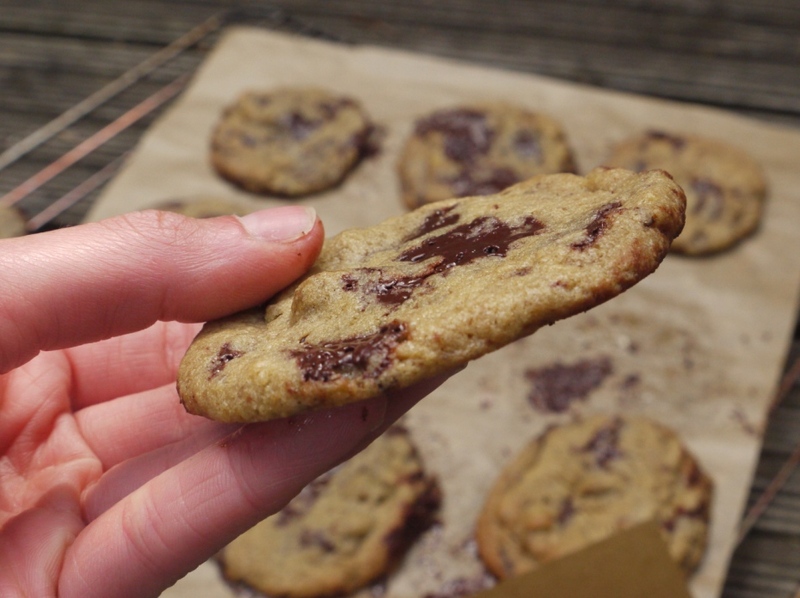 I’m going to have to try that next time I bake a batch of chocolate chip cookies. Erin – thank you. Baking out of your comfort zone is definitely a must for new discoveries! Jennifer – thank you and enjoy! Laura – I only made very basic stuff without the scales – damage limitation! I love the combo – they look so great! I don’t think I could live without scales I use them all the time (even to weigh out cereal!) these cookies look delicious, yummy indeed! Jenny – you weight out cereal? That’s very precise of you! I have been reading backwards since your last post to catch up on all your scrumptuous recipes. Looks like you have kept pretty busy in the kitchen. 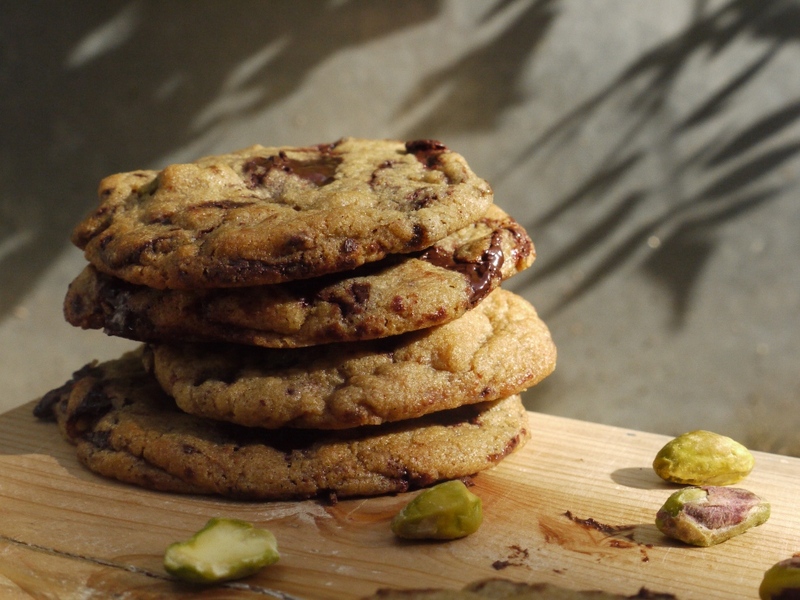 I can never resist a choc chip cookie, and with the added bonus of pistachios…don’t even get me started. Am reading that recipe carefully as those cookies look exactly how I like them!